Remember, remember, the… wait, what was it again? You're supposed to remember something… shoot, this always happens in November. Ah, yes, you need to turn your clocks back this weekend, daylight savings time is over and it's early to bed, early to rise from now on! So you can bring in the harvest. That's a joke, obviously -- most people don't harvest anymore, a fact that wouldn't have mattered at all to Guy Fawkes, who just wanted a Catholic king again. Kind of makes those masks seem silly. The real function of daylight savings time is to make you more depressed at work! You won't see evening sunlight for months! Anyhoo, one of the few upsides of November is the harvest that others collect for you, which gives you some of the following in-season foods to enjoy while autocratic rulers trample on your freedom. Yum! Time for some big buck hunting, just not at the dive bar that's trying too hard to be a dive bar but you go there anyway because it's close and your friends will be there and lots of people are looking to hook up there, even though it's gross and overpriced for what it is. Get out there and get you a real deer! Venison somehow just made it onto select Arby's menus, which is… confusing? Aren't all fast-food chains required to use Grade F factory meat? Where are Arby's deer coming from? Does a guy in a pickup drop off deer carcasses at the back door? So many questions. Arby's CMO, Rob Lynch, says they're free-range farmed deer, which apparently exist, and claims, "Deer hunters are going to love this sandwich!" But you'd have to be a clinically insane deer hunter to eat an Arby's venison sandwich, right? What would be the point of killing a deer on your own? 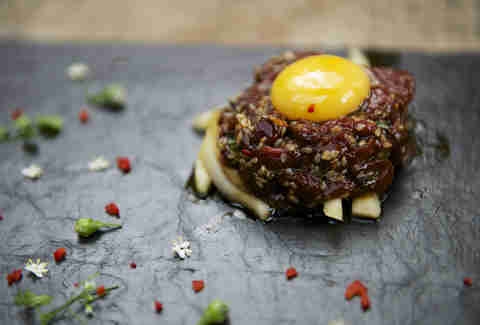 Anyway, if you're going to eat red meat, make it wild venison, a more environmentally friendly alternative to beef. Carrots had a good run as an orange food, but you're sick of those now. Everything's orange these days: basketballs, presidential candidates (ZING! 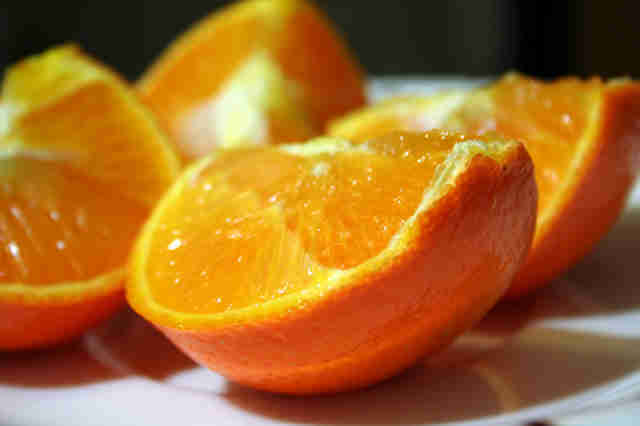 ), oranges, national terror alerts. What about purple carrots? 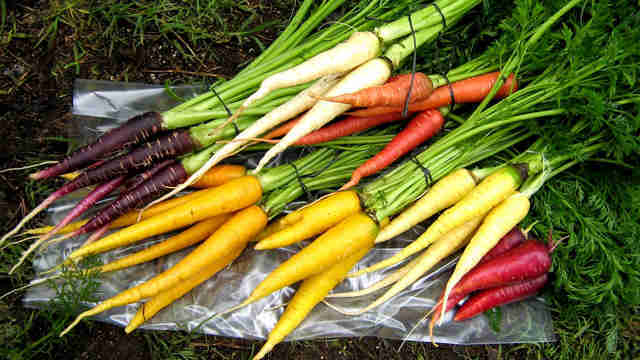 White carrots, which definitely aren't parsnips? Red and yellow carrots? There are all sorts of carrots out there to spice up your otherwise monotonous vegetable life, so since you're REALLY going out on a limb, you could encrust a few of these in falafel batter (or another batter of your choice) and fry them. No one said carrots had to be healthy, and you'll be getting all the beta-carotene your body can handle in November thanks to the plethora of orange foods you'll be consuming. More on that to come! Already delivering on the promise of more orange! 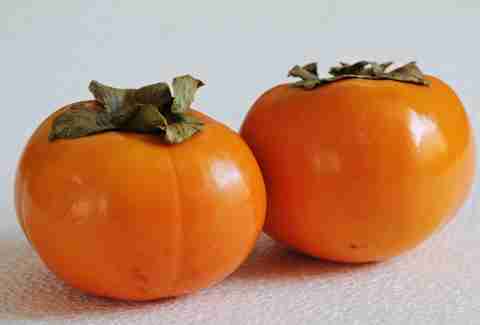 Persimmons can frighten some people off, because what the hell is a persimmon, anyway? Knowledge is edible power: They're a fruit! There are all sorts of varieties, but fuyu tends to be the easiest to find, which is a good thing since you can eat them while they're still firm, unlike astringent versions which need to be almost-mushy soft to be palatable. Whatever you do, try to stay away from too many unripe persimmons, which can basically turn into cement in your stomach. You want the beta-carotene and the fiber, not the surgery for an obstructed bowel. Inflammation Is Bad News. These Foods Fight It. 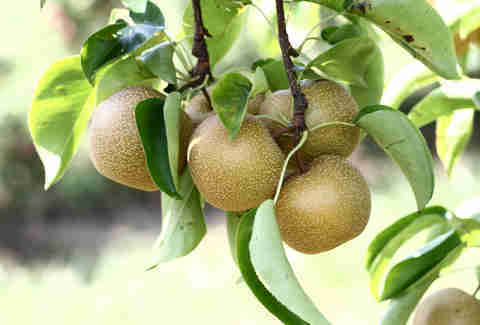 Asian pears are what would happen if a pear and an apple had a child together, which they can't. Thankfully, Asian pears exist; in Korea, they're called bae, which supposedly is a meme of some kind? There's probably a person somewhere making brilliant GIFs out of this bilingual pun, but for your purposes, Asian pears should be eaten raw. Good ones will be crisp like an apple, but sort of have the grainy consistency and tartness of a high-quality pear, and you'll be like, "Whaaaaaa? I thought it was noon, but it's only 11am!" 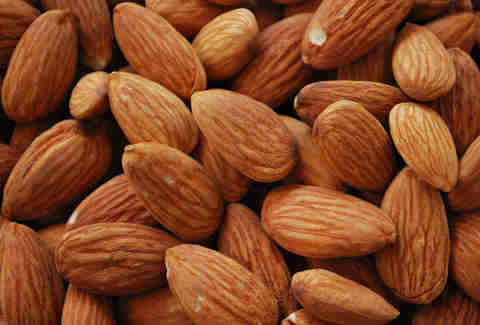 Eat enough of 'em, and you might just reduce your blood lipids and cholesterol. 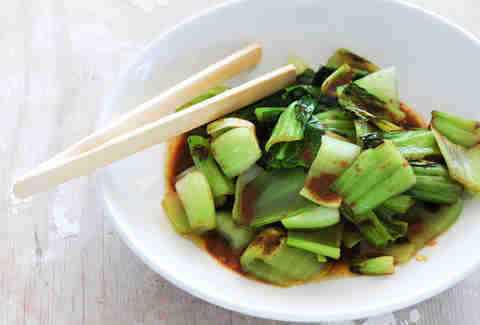 In Korea, bok choy is called 복 쵸이, or bok choy. Bok choy is a brassica -- oh, you've heard of the brassica family? The group of overachievers who also play in a hip band and are good at sports/helping you live forever, so you can't really hate them? Cool, glad we're on the same page. Bok choy is almost two plants in one, its leafy green parts good for... leafy green things, like salads, and its sturdy stems good for stir-frys or pickling. Try both, maybe at the same time, and turn your kitchen into a total disaster! The first rule of becoming obsessed with healthy eating is: Find a good raw date ball recipe. 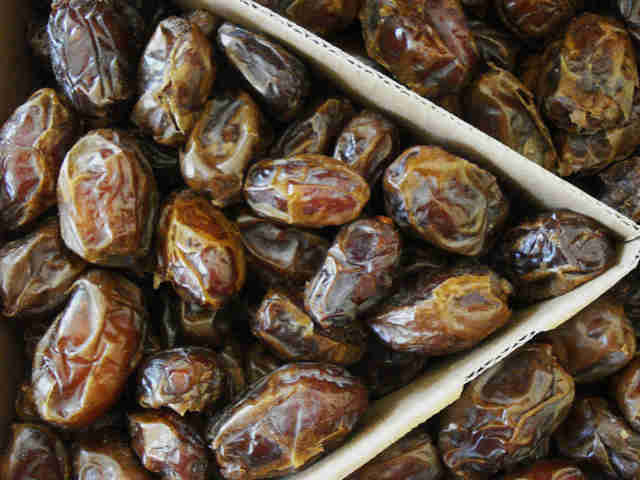 The second rule of becoming obsessed with healthy eating is: Tell every person you know about your raw date balls. Virtually all of them are variations on a cacao/date/coconut theme, but you're not getting points for creativity; you're getting points for antioxidants and reducing refined sugar consumption. Wait, what game are we playing? Ah, yes, the Sugar Game. Don't eat too much, or else you lose, in the form of diabetes or obesity or cavities. In addition to rhyming with Vaseline(s), tangerines will help fill the beta-carotene void in your life that's depressed you ever since you gave up regular carrots. Buck up, kiddo! Tangerines are one of the few benefits of colder weather and less sunlight, so enjoy them next to a warm fireplace you certainly don't have because of draconian "fire codes" designed to prevent "mass accidental death." Maybe you can even turn tangerines into a fun craft by sticking whole cloves into them, which works best if you don't have Netflix, cable, music, friends, or windows. Remember the time scientists cloned a tangerine from a tomato? What will they think of next?! With a name like "Sucrine du Berry," it's got to be good! 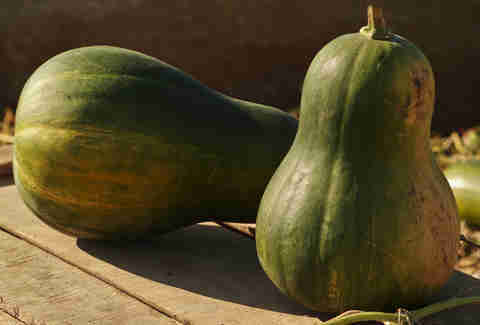 And it is, though the mature squash have a lighter color that's closer to a classic butternut than the greenish hue depicted above. Beggars can't be choosers when it comes to Creative Commons images, so you'll have to use your imagination, if you still have one. The pledge to deliver beta-carotene was a serious one: These squash are ALSO orange, which you should know by now is a sign that a food is really, really good for you, Cheetos notwithstanding. Sucrine du Berry squash is pretty close to butternut squash, perhaps a bit less sweet; you can typically use it for any butternut recipe just fine. Squash and sage were made to meet in an oven, so throw them together in there with some oil, salt, pepper, and whatever else you like, and pat yourself on the back for avoiding all major diseases for as long as you live. Well, if you're looking to cause drama at the Thanksgiving dinner table, use Japanese sweet potatoes to make grandma's secret sweet potato casserole recipe that she entrusted to you shortly before passing on. In a classic M. Night Shyamalan twist, these sweet potatoes aren't orange -- they're white, and grandma was alive the whole time! 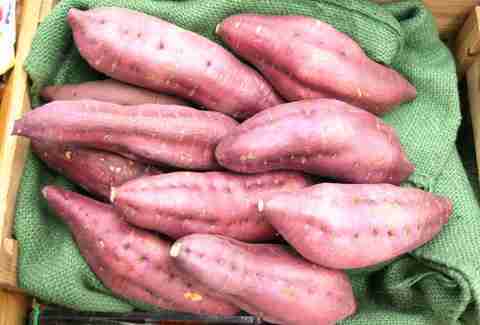 When cooked, these tend to stay firmer than your typical sweet potato, so keep that in mind for mashing purposes. However you cook them, know that these guys may just have some anti-hypertension properties, vital for any holiday get-together. 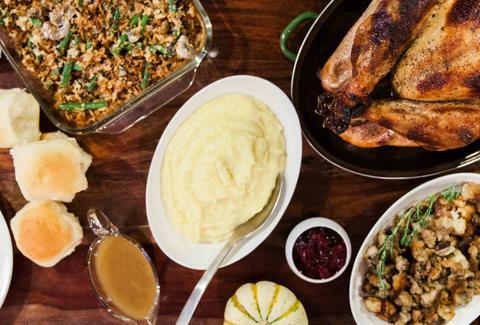 Swallow that criticism of the way your sister raises her kids, along with the third serving of turkey you probably don't need. Fortunately, our nation's founders, those hardy and not-at-all-exploitative pilgrims, likely intended for their descendants to express their gratitude for living in a nation of plenty by drinking beer and watching nine straight hours of football and avoiding meaningful conversation. Hey, at least it's a four-day weekend! Anthony Schneck is the Health editor at Thrillist. His annual Gunpowder Plot bashes are the talk of Brooklyn. Follow him @AnthonySchneck.